Washington, D.C., (Mar.12, 2002) -- Federal, state and local authorities, law enforcement agents and the American people need to know about terrorist threats as quickly as possible. To ensure that happens, President Bush today signed a directive creating the Homeland Security Advisory System. This system is the foundation for building an effective communications structure. 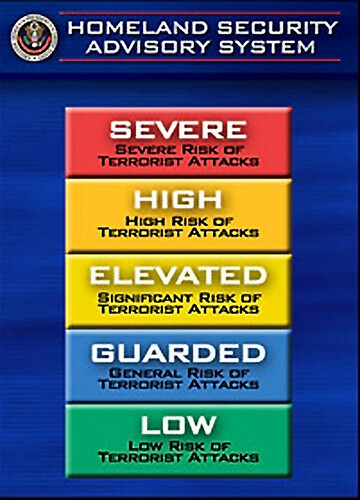 Government officials characterize levels of vigilance, preparedness and readiness in a series of graduated threat conditions. 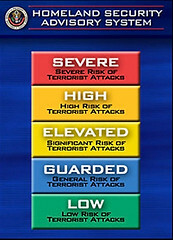 Threat Condition Green represents the lowest level of preparedness while Red the most severe. These threat conditions would help federal, state and local government officials, law enforcement agents and citizens decide what action they could take to help counter and respond to terrorist activity. Image courtesy the Homeland Defense web site at www.whitehouse.gov/homeland.